As we all know that very soon Google will announce the new Nexus 6 and Nexus 9 with the new Os Android L. So today is the perfect day to factory reset or Unroot your nexus devices and ready for resale. If you have the nexus device with unlock bootloader, custom rom and rooted and want to resale it. Here is the guide which helps you to locked the bootloader, unroot and factory reset your device in some simple steps. No need to search the drivers, stock image or any other files on the forum, all you need a one tool which will do all of these things in very simple manner. Today in this guide we’ll show you the WugFresh‘s Nexus Root Toolkit v1.8.8, This kit allows you to to quickly and easily make your desired changes to your Nexus devices. 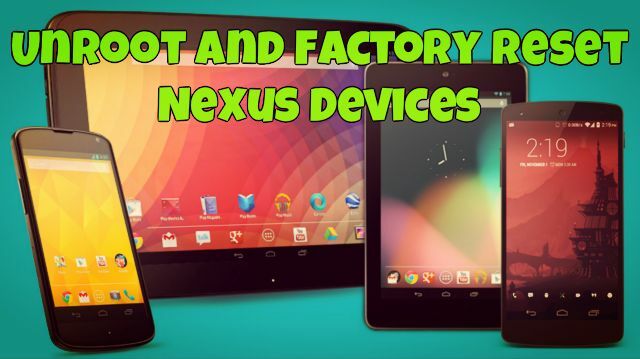 This free tool helps you to how to Unroot and Factory Reset your Nexus device. The guide is so simple and take few minutes to complete all these task on your nexus device. 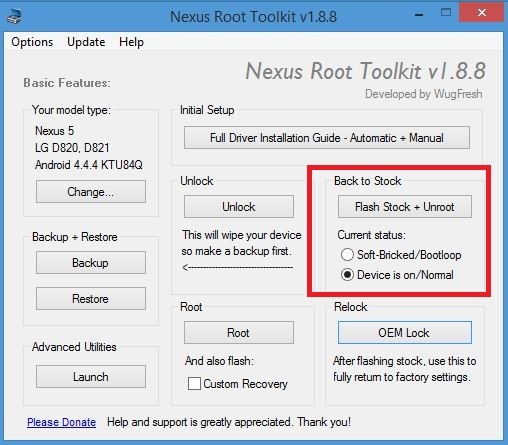 We also posted the manual method to uproot and flash stock rom on nexus device, but if you are looking for the easier way then try this toolkit on your windows PC and nexus. Step 1. 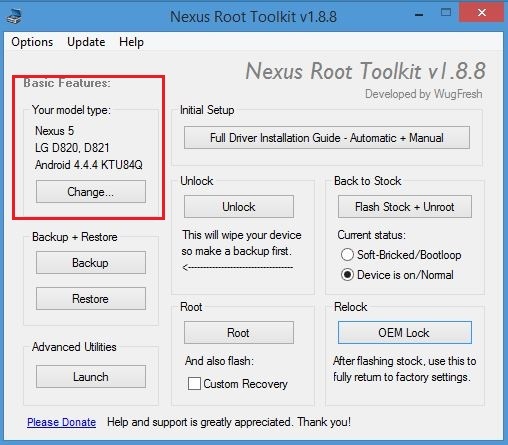 Download the Nexus Root Toolkit v1.8.8 here and install the same on your PC. Step 2. Now enable the USB debugging mode on your phone and connect it to the PC with USB cable. Step 3. Now run the Toolkit on your PC and it will detect your device and build of your ROM. IF not than follow the onscreen instruction to connect your device to the toolkit. Step 4. Once the device is detected you will see the device name and build number on the app screen. Step 5. Now to unroot your device and flash the stock firmware on your nexus, click on the “Flash Stock + Unroot” button form the app and follow all the onscreen instructions like in install the drivers and stock fimrware. Step 6. Once the process is completed your deivce will reboot. now again enable the usb debugging mode on your phone and connect to the pc to Lock the bootloader. Step 7. 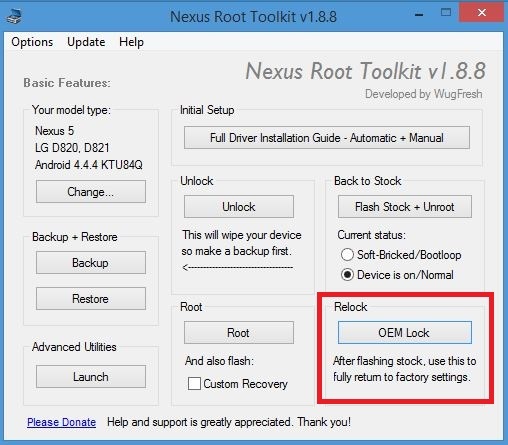 Again run the tookit on your PC and this time click on the “OEM Lock” button to lock the bootloader of your nexus devices. After this your nexus will reboot and your device is running with locked bootloader and with the stock ROM. Now you can resale your device in the market or with your friends.